Well, my seedlings are still alive and growing slowly but surely. Take a look! You'll notice that the sunflowers and squash have come up well, while there are just a couple beans poking up, too. This sunflowers get me all excited because they are a combination of my own saved seeds from two years ago plus purchased seeds from Native Seed Search, and both sprouted! That middle square at the top has a bare patch but that's not due to critters eating seedlings; nothing ever came up! I don't know if the seeds were eaten by birds, if they were buried too deep, or if something else happened, but that spots has remained bare enough that I might plant something else there before too long. Whether it was the spiky weeds used a a smidgen of mulch, the onions hiding the smell, or just dumb luck, nothing has eaten these plants yet. There's been a few nibbles on a few leaves, which I then covered with more spiky weeds until they were big enough to withstand whatever bug had munched on them, but so far, so good. I take nothing for granted, however. As these grow, they might get big enough to get furry critter attention, and if that happens, well, we'll see how it goes. You'll notice these aren't very big, and this is pretty standard with most plants in my garden. I simply don't have the compost in high enough amounts to truly make some good soil. I expect this will slowly improve over time as I add more and more compost over the coming months and year, but right now, it's likely to get me a small garden. So, on to some of the interesting things I've learned about caring for a waffle garden so far. 1. Watering takes time and more water than you'd think. It's more complicated than you might think, or maybe I just overthink this because I'm obsessing, but in either case, here's what I've learned so far about watering a waffle garden. First, how much water to you add? In the beginning, I was filling up the square to the above level, about 2 inches high. I watered daily for the first week as the seeds got started. For comparison purposes for anyone who is making their own, I'd say that if I had the entire garden altogether in one mass, it would measure about 8 feet by 8 feet. The waffle depths are around 3 inches for mine. The first day I watered, it seemed like an awful lot of water. So I kept track the next day. The daily water usage, if I fill up each square with about 2 inches of water, is around 18 gallons of water for the entire garden! I was shocked at how much water I used for this! 0.0 For what I was hoping would be a low water method, that's a heck of a lot of water! Although I have no idea how much water I use in other areas of my garden. I don't believe it's this much, usually, but maybe I'm just fooling myself. I'm also uncertain about whether I'm using the amount of water I should be. I've been told that I should fill up the squares, but I must say that I wonder if that's the case, seeing how much water that actually takes. I've already started filling the squares with a little less and also, I only watered daily for the first week. Right now I water every other day, and eventually I'm supposed to be able to do every 3-4 days, if it all goes according to plan. That will keep the water levels down to around 28 gallons a week, hopefully. Seriously, the more I look at water usage the more I goggle at it. There's just something about living and gardening in a desert that makes you think about water more. I have a feeling if I looked at how much water I use when I shower, I'd cringe. Another element of the watering is time. I have to slow down and go with the flow for this. I'm currently using a bucket of water and a cup that I carefully pour into the recessed beds - similar to how it was mentioned that Lorrain did it - because otherwise, the dirt erodes away where the water is coming in. A hose is not a waffle garden's friend, at least not my waffle garden. However, a little erosion is still happening, even with the cup watering method. Lorrain used a bucket and a can, so I know that this method isn't flawed in and of itself. What I don't know is if I'm too rough in how I pour, if the crust wasn't compressed enough, or maybe the sand on top makes that difference in erosion. It could also be that this is a natural, normal part of the waffle garden that simply happens and I have to keep an eye on it. 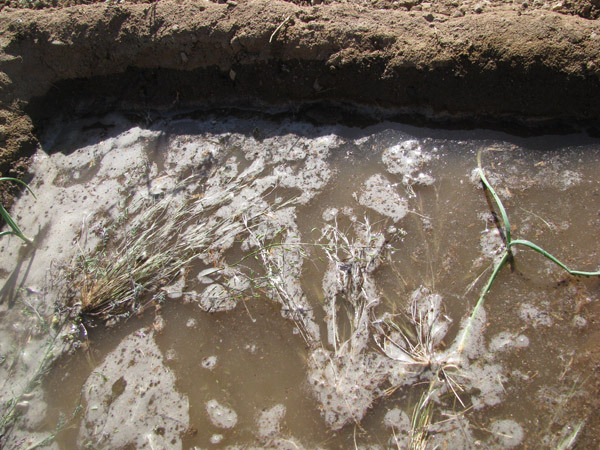 I did eventually add in some homegrown mulch, and after that, there has been less erosion as the water gets dispersed through the mulch. I have ended up mulching all the squares, although some only barely. It's just been so helpful in keeping the erosion down, and also in protecting the seeds from being found by things like the grasshoppers in my yard. I also have a lot of excess weeds around, so that's available to me. This mulch is not very thick, though, maybe 1/2 inch for the couple squares that have the most. The rest have mostly a bare covering of plants over the ground. I was concerned that with the filling of the waffle squares with water, there might be some problems with the plants and dry mold, potentially. So far, though, so good, and the squares with a little mulch seem to retain water for a little longer than those without. Next year, though, I'm definitely going to try sand for this. 3. Structural integrity of the walls is crucial! 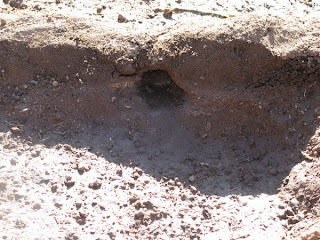 A small animal took at look at the walls as a possible home and dug a little hole part way into one. I wasn't sure if there was a little critter still in there, so I watered that area, hoping to drive the little thing out. Instead, it nearly collapsed that section of the wall and began leaking through to the other side to erode that area, too. I had to rebuild the entire section. So, lesson learned: any major flaws in the walls need to be addressed before watering! 4. Bees like waffle gardens! If you've read my post on attracting native bees, you might recall that around 70% of Sonoran Desert bees are burrowing bees. I've read that they are very particular about what soil they choose to make their burrows in. It looks like the walls of a waffle garden are just what they like! The kids and I have already witnessed two different types of burrowing bees making little holes in our waffle garden walls. One of them is low enough I'm a bit worried that it's going to be flooded out when I water, but I might water that space less so the bee will do all right. We'll see. It's been very fascinating to watch the bees digging and clearing out their burrows, though. Total homeschooling moment! 5. 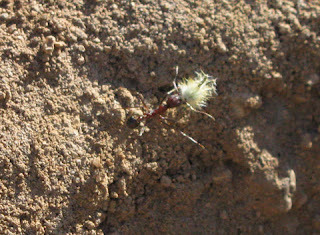 Ants like spiky weed mulch. I was unaware of this before, but it looks like ants really like those little spiky weed's seed pods. They keep coming into my garden to steal them from the recessed garden beds! 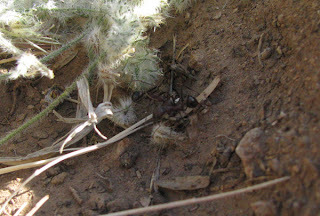 Ants stealing my spiky weed mulch! It hasn't decimated the mulch population, but it definitely made a dent in it. However, on the potential plus side, I think the high level of activity by the ants has kept away some of the insects that might otherwise have eaten my garden. So far, I"m pretty happy with my waffle garden. The plants have not been stressed at all with watering every other day, to the point that this week I'm finally going to try to water every three days and see how they do. I hope well. There are three different 'sections' of the waffle garden right now. 1. 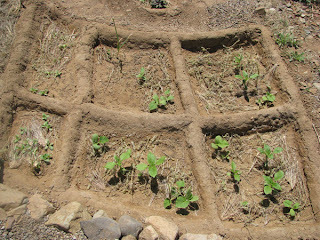 The sunflower, squash, and bean squares. I fill up the squash squares with a little more water, the tomatoes with a little less, and the safflowers with the least, as I heard they are very susceptible to too much watering and prefer less water. Like I said, so far, so good! This is great! Thank you for sharing. I'm starting my Fall garden and decided to try the waffle idea. I can't wait to get started.